The biggest football mega event is just few months away. 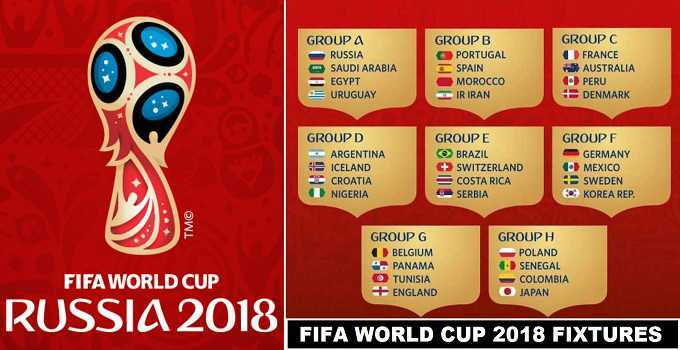 The world cup draws take place in Russia and eight groups were confirmed each group 4 teams placed. The world matches schedule were confirmed Russia will began the tournament with the first match kickoff against Saudi Arabia in Group A. On 15th June there are two matches played between Group A & B teams. 14 June is the starting date of the tournament and the final played on 15 July. The opening venue for the Fifa world cup 2018 will be (Luzhniki Stadium) and final match also played at same venue. The sitting capacity at the Luzhiniki stadium is for (81,000) people. The first semi final match will be played on 10th July and Second semi final played on 11th July. Saint Petersburg stadium is the place from where the first finalist decided for World Cup 2018. The second finalist for the world cup 2018 will advanced from the (Luzhniki) from Moscow on 11th July.